As you are likely well aware, Colorado weather can be harsh on your roof and gutters regardless of what season it is! Whether it’s the snow, hail, heat, wind or a combination of all of the above, your gutters take a regular beating, making proper maintenance vital to the health of your roof and ultimately your home. Proper channeling and diversion of the rain off of your roof and to the ground is necessary all year long to avoid costly roof repairs. Leaves, snow, hail, and other debris can impede your gutters’ ability to get water off your roof. An annual cleaning and clearing appointment with our roofing contractors is easy to make and costs far less than the damage that un-cleared clogs might produce. Why Replace My Old Gutters? Every roofer knows that leaks can cause rotten fascia board, damage your siding, create ugly water stains, and cause unwelcome erosion. 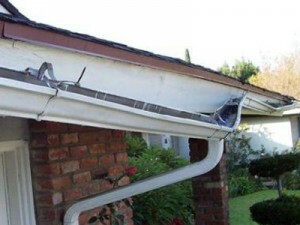 Gutters without the correct pitch can cause leaks, overflows, and too much weight for them to handle. 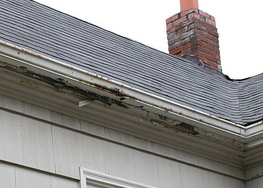 Don’t let damaged gutters ruin your home. Why should I Buy New Gutters? Gutters are a necessity to divert the rain from your roof to avoid structural damage, damp walls, and mold. Updating your gutters will provide longevity to your roof as well as update the look of your home’s exterior. Contact us today for a free estimate on your gutter repair, replacement, or installation, and discover how we put ourselves apart from other roofing companies in the area.